The person we are today is not like the one we were when we came into the world. The evidence is overwhelming. Our actual body, our skills, our knowledge and our experience do not resemble the body, the powerlessness, and the ignorance of a new arrival born from the womb of his/her mother. What has happened in the meantime? How could this little pile of flesh, barely 5 kilos, completely dependent, without words, without sight, without coordination, become an autonomous person in this world, intelligent, grown up and mature? Of course, that did not happen overnight. A succession of billions of tiny, small and large growth processes have turned this infant into an adult. And these growth processes never stop. They simply continue with time and according to the evolving dialogue between choices, circumstances and cosmic laws. Some growth processes are consecutive. The completion of one process always leads to the beginning of the next growth cycle. For example, the growth of new-borns into babies, toddlers, children, teens, young adults, adults, seniors, elders. Some processes are parallel and influence each other. For example, biological growth and psychological growth have a mutual impact, but at the same time they are not totally conditioned by each other. Biology and neuropsychology attest to the influence of our genes and our physical brain on our personality and our behaviours. And inversely, the study of bioenergetics establishes a link between the constitution of our character and its influence on the formation of our physical body and our muscular structures. Through the years and through my activity in therapy, healing, coaching, body-mind integration and spiritual development, I have come to appreciate the patterns of growth as cyclical processes. Over the years, I have developed and refined a model that has been very useful for understanding growth and evolution – from the perspective of our limited and finite human understanding. Much more than a form of understanding, this model has been beneficial to me in that it allowed me to manage more harmoniously the growth processes, both for myself and in the accompaniment of others. Regarding evolution and growth, one can adopt two unfavourable positions, while a third positive-neutral position constitutes a particularly favourable attitude. It helps us to experience the growth process as smoothly as possible and allows us to actualize the best and highest potential in this process. This third positive-neutral position is the proven way between two unfavourable polar positions. To ascertain the middle way, it is maybe easier to study first the dualistic deviations of this golden path and then detect the contrast. In the bipolar disjunction we find on the one hand that we can (temporarily) thwart or side-track growth and, on the other hand, that we may rush into hasty changes. These two polarities each constitute an obstacle to natural and organic development. Any growth is always associated with some inertia. This inertia is not in itself a contradiction to growth. We will explore this question further with the study of the ‘resistance’ phase. It can be a balancing factor that ensures the correct pace and rhythm of a maturing process. Opposition, however, is an active or passive motive against the healthy evolutionary movement of life, whether in individuals, in nature, or in society. Passive counter-activity is the result of laziness, unconsciousness and a lack of vision. Indeed, this form of inertia belongs to passive resistance to enhancement. Active resistance is a more or less conscious opposition to the organic expansion of the evolutionary flow of life. This attitude may be motivated by fear of change or the unknown, nostalgic attachment to the past, or blind faith in tradition. There are thousands of forms of resistiveness and at least so many reasons, often understandable, but therefor not justified. At the other end of this polarity, there is an obsession with forced change. This polarity has a passive and active variant as well. Passive compulsion is a form of neurosis. It is a blind pressure in a direction that knows no foundation. This can be a form of servility to an overactive society. It may be a circumnavigation from the present moment, an inability to fully live experience the here and now in its completeness, … or many other mechanisms. The active component of the compulsion of forced change is as blind as the passive component, yet already stands out from the herd behaviour. It has an egocentric revolutionary aspect. It opposes what is and seeks to impose its idealized image on itself and / or its surroundings. Embodying one’s own ideals is great. Imposing these principles onto others is act that is prone to provoke hostility. It is a form of idealism that has become too fanatical and maladjusted. An excessive ambition and a fanatical idealism empty the changes of all their true sense and vital substance, and are merely the blind pursuit of a mechanical gear. The path of the neutral-positive medium keeps us aligned with our highest potential and allows its germination, maturation and mobilization in harmony with the infallible rhythms of evolutionary growth. This path perfectly balances the active and passive aspects of development. This balance eliminates the risk of deviation towards extreme dualities. In addition, the active and passive components are in this case perfectly matched. The two poles work together flawlessly, complementing and reinforcing each other: effort and rest, acting and being, active and passive, giving and receiving, directing and following, initiative and receptivity, etc. In these conditions, the two poles are optimized as constructive components while maintaining a creative balance. No effort will ever be lived as a pressure because it will be undergirded by a dynamic state of being. Any state of rest will not slip towards torpor because lucid awareness will remain present. This neutral-positive middle way that we gradually master with the practice of Presence Integral is the most authentic and natural way of being and living. And that’s what makes this path so beautiful. There is no need to pave this path for ourselves because the act of living authentically opens the way. Needless create the path in order to find the permission, the courage or the strength to live authentically. It’s putting the cart before the horse. This road unfolds spontaneously by being authentically who we are and by living from the heart, the soul and the spirit. The transformation cycle can be studied from many angles. We can propose variations, summarize certain aspects and develop others. Over the years, there are mainly 6 elements in this cycle that seemed to me crucial. Therefore, I call them the 6 phases of the transformation cycle. A simple example is the clearest way to present them. A 6-year-old child goes to primary school for the first time. The child does not yet know all the subjects that will be provided. This is the preconscious phase. There is a form of knowledge in approach, but for the moment it is still out of the mind of the child. In the classroom, the children are gathered together and the rules are put in place to bring order the group and to install the education system. Even if the child is easily adaptable, he/she will always have to get used to facing a new situation. This is the resistance phase. This phase is as natural as all the others and is by no means negative in itself. Then the lessons begin and the study material is presented. This is the confrontation phase. New information stimulates the child’s awareness. This causes agitation in the child’s consciousness. The ideas, knowledge and images established in the child’s consciousness are linked to new ideas and knowledge. This new information may be partially consistent and partially incompatible with the world of previous ideas. This agitation is the phase of chaos. The consistent information can confirm and support previous knowledge. The initially inconsistent information can cause astonishment that will give some pressure to convert the conflicting information into a new consistent set. This is the reorientation phase. New ideas and concepts are formed and the child begins to adopt and embrace the learning materials. Once the learning material has been understood, the child can use this knowledge and benefit from it. 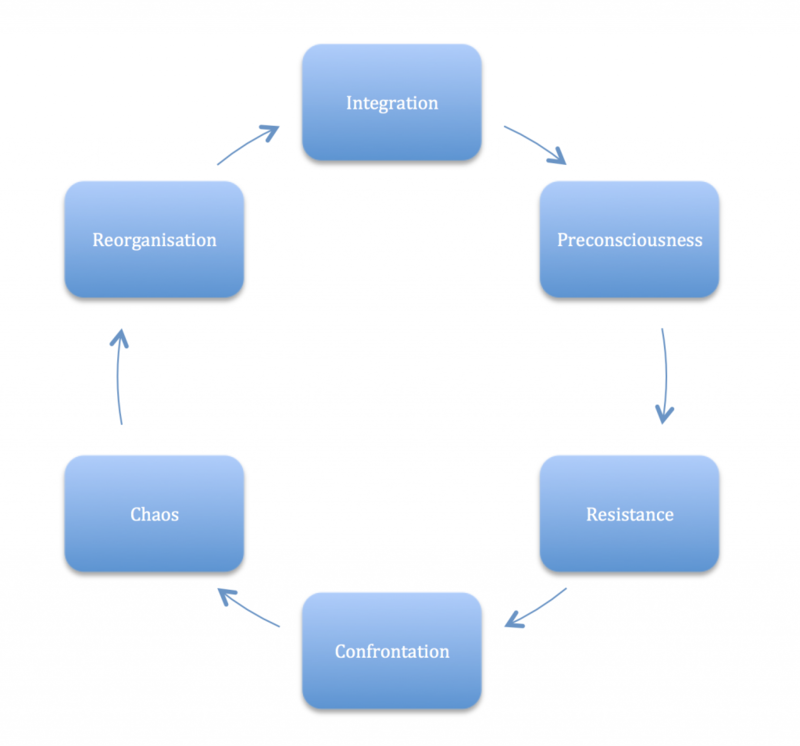 This is the integrationphase. All of the six phases are part of the natural evolutionary process. An authentic learning process unfolds harmoniously and spontaneously. We do not have to invent or control this process. It unfolds automatically. However, it may occur that some snags slow down or obstruct some phases. In this case, a good understanding and a good support of the transformation cycle can allow the natural growth process to return to its optimal cruising speed. We can never determine the growth process, yet we can help it punctually. The intention is not to fabricate processes of transformation, learning or growth. This is a forced change operation. Growth is a spontaneous movement that comes from within. And it comes with all the necessary power and wisdom for accomplishment. It is therefore a question of following the movement and of finally surrendering to it entirely. When we surrender ourselves completely to the flow of our being, all stages of the cycles of growth or transformation can be smooth and barely distinguished. As sublime this path can become. The transformation cycle has been identified in a variety of change processes. Learning in education, biological growth of plants, animals and humans, cell division, healing of trauma, evolution of science, group dynamics, social development, spiritual growth, Cultural evolution, the theory of evolution, the cosmic movements of the universe, in short all the phenomena of the manifest world are constantly in a process of change. … is a path of consciousness and perfection. The word “perfection” does not have the meaning of perfectionism here. It’s a road of progression, to become authentic, to be who you are, and to realize your full potential. It includes a growth element and a unifying element. Growth is the evolution of a more or less limited identity towards a broader consciousness, a larger awareness of our true being and a constant renewal of our inner capacities and resources. 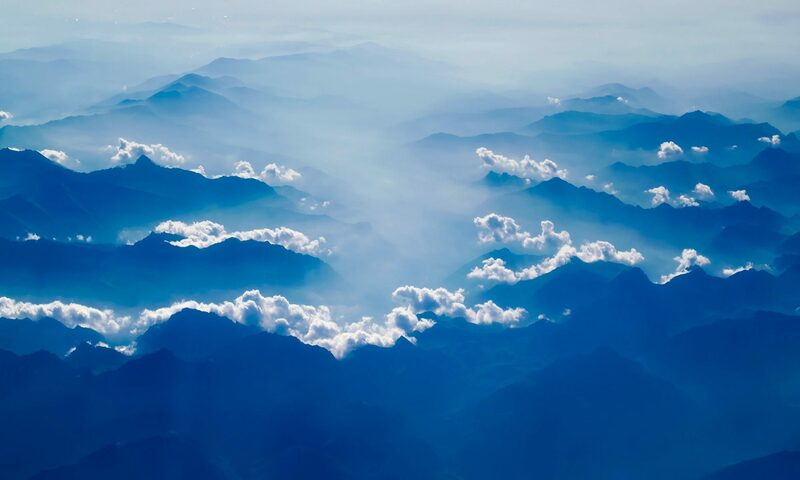 The element of “unification” can involve, on the one hand, healing – the return to wholeness – and on the other hand it can concern integration as a harmonious connection of the different facets and internal dimensions of a coherent whole.